It appears the trusty rumor mill isn’t so trusty. 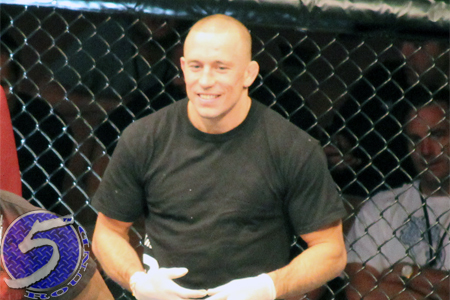 Despite numerous reports surfacing that UFC welterweight king Georges St-Pierre (Pictured) severed ties with MMA guru Greg Jackson, all parties involved quickly killed the erroneous chatter on Wednesday afternoon. “Spoke to Greg Jackson re: rumors that GSP left him,” ESPN’s Josh Gross tweeted. “He talked w/ GSP an hour ago. They’re fine. Also, he doesn’t have contracts w/ fighters. Firas Zahabi, the Tristar trainer who works extensively with St-Pierre and would have benefited the most from his split with Jackson, provided a similar response when probed about the whispers. “The rumor is not true. LOL,” Zahabi texted Ariel Helwani. St-Pierre is currently on the mend from a December knee surgery. The 30-year-old could be back in action later summer.